The Italian has experienced a mixed debut season in the Premier League with the Blues and the club are currently just outside of the top four positions with seven games to play. Still, there are growing concerns whether the former Napoli boss will remain at the helm next term and The Daily Mail claims that the Giallorossi are keeping a close eye on the proceedings. The Serie A side are currently under the interim management of Claudio Ranieri but they are expected to recruit another experienced manager at the conclusion of the campaign. 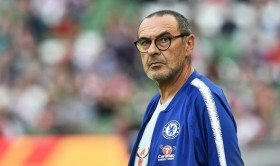 Sarri was recently booed by the Chelsea supporters in the away game at Cardiff City before the club sealed a dramatic 2-1 comeback triumph under controversial circumstances.